Francesco Clemente, Oil on canvas, 82x117 cm. 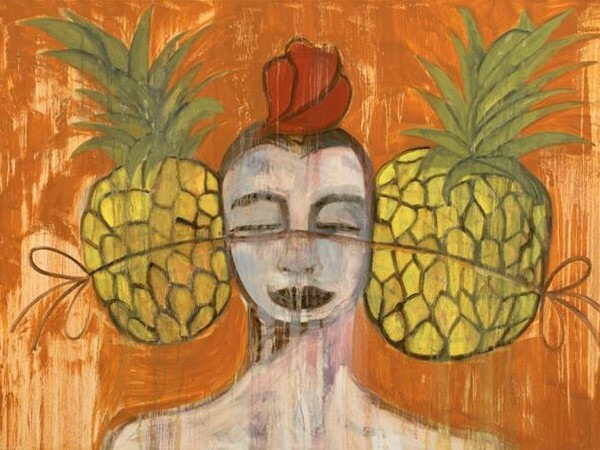 This series of new oil paintings by Francesco Clemente is inspired by the great Spanish writer Federico García Lorca’s poem of 1930: The King of Harlem (El Rey de Harlem). Written in New York, immediately following the stock market crash of 1929, the poem responds to the sorrow, joy, music, and vitality of the city’s historic African-American community. Lorca’s interest in revolutionary politics and social change, as well as his early involvement with Surrealism, offers natural synergies with Clemente’s artistic vision and the themes of life and love that have powered his works for decades. The resulting series is an engaging tribute by Clemente to poetry, to creativity, and to endurance. It is a unique ode to the city of New York, where the artist has lived for over 35 years. Born in Naples in 1952, Francesco Clemente lives and works in New York and India. Retrospectives of his work include: Sezon Museum of Modern Art, Japan (1994); Solomon R. Guggenheim Museum, New York (1999); Irish Museum of Modern Art, Dublin (2004); MAXXI National Museum of the 21st Century Art, Rome (2006); MADRE Contemporary Art Museum, Naples (2009); Schirn Kunsthalle, Frankfurt (2011); The Uffizi Gallery, Florence (2011); Springs Art Center, Beijing (2017).